Over the past 30 years, our centres have treated over 60000 cases, a large percentage of which have been that of Psoriasis and other skin conditions. Since Psoriasis is considered as a chronic, non-curable conditions as per modern medicine, most sufferers are given the impression that their condition will accompany them till the end resulting in resorting to local creams and steroids which only suppress the problem temporarily. Most aren't aware that Homeopathic medicines can completely cure this ailment if treated timely or can be prevented from progression after a short course of Homeopathic treatment. Also, patients are usually under the impression that Homeopathic medicines take too long and need to be taken for life time. On the contrary, if treated early with Homeopathy, the course could be not longer than 6-12 months and even if discontinued, the homeopathic medicines have the added advantage of preventing it from progressing. 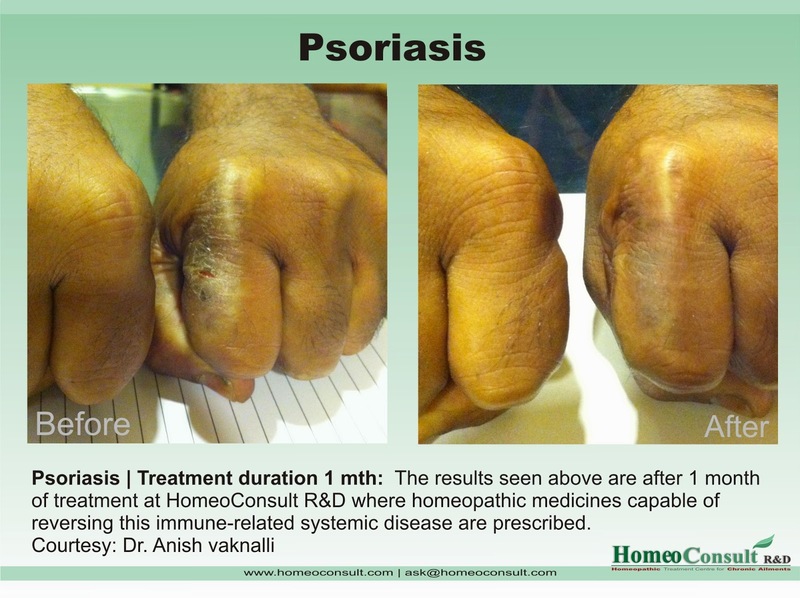 Here we have highlighted some cases and our patients testimonials and encourage you to consider Homeopathy for Psoriasis. 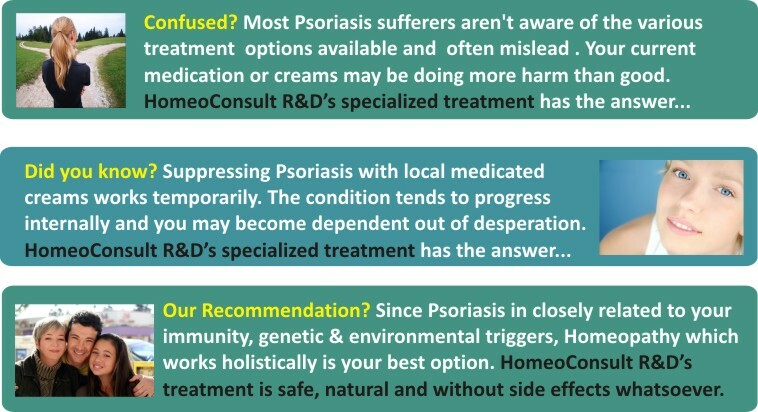 Hope you do take advantage of this wonderful, safe and natural mode of treatment and experience a cure as so many have done at HomeoConsult RD clinical centres. 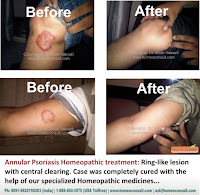 Case of Annular Psoriasis cured with a Constitutional Homeopathic remedy. Mr. Gupta suffered from psoriasis for over 2 years and had recently developed new patches on his arm and legs. On taking his life history and understanding his personality traits we realized that his condition was triggered by stress and was easily influenced by trivial issues. Homeopathic medicines prescribed not only helped his immediate skin problem, they also reduced his stress levels. 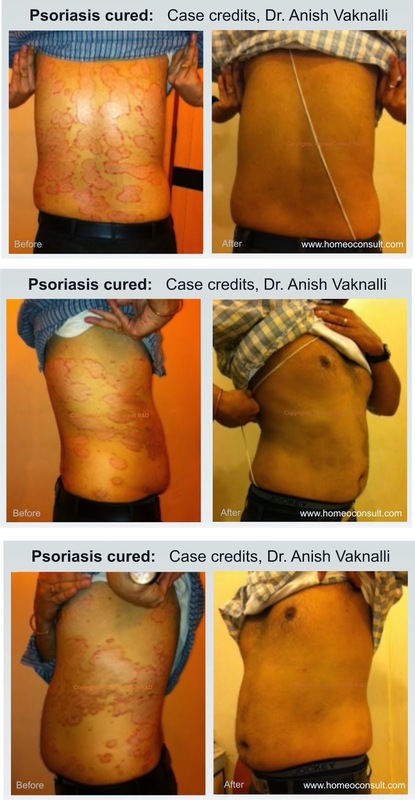 Mrs. S approached Dr. Anish Vaknalli for her condition of Psoriasis which had developed more than a year ago. 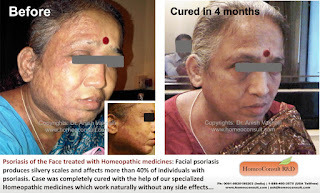 She had tried numerous homeopathic medicines and had taken homeopathic treatment as well as applied allopathic creams which yielded no results. Her condition had affected her entire face, neck and eyelids with sever itching. On taking her case in detail we realized that her life situation was very stressful and faced challenges on a daily basis. She was put on a constitutional homeopathic treatment in which only a few doses of the remedy are prescribed on a weekly basis. Today she is practically free of this condition. Mr. Y, an old patient of Dr. Anish Vaknalli, suffered from psoriasis and was under conventional allopathic treatment for over 2 months. The problem persisted and was increasing. 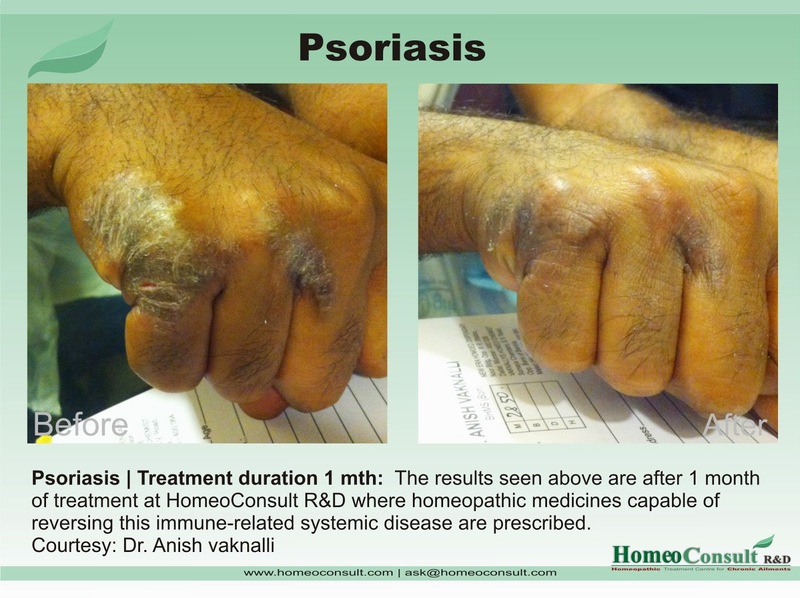 A constitutional homeopathic approach cleared his psoriasis within 4-5 months and has till date never experienced a relapse. Psoriasis is a non-contagious, chronic skin condition that produces round, dry skin patches of varying size that are covered with white, gray, or silvery-white scales. Remissions and exacerbation are commonly experienced in most cases. Normally your skin sheds its layers every 25-30 days. 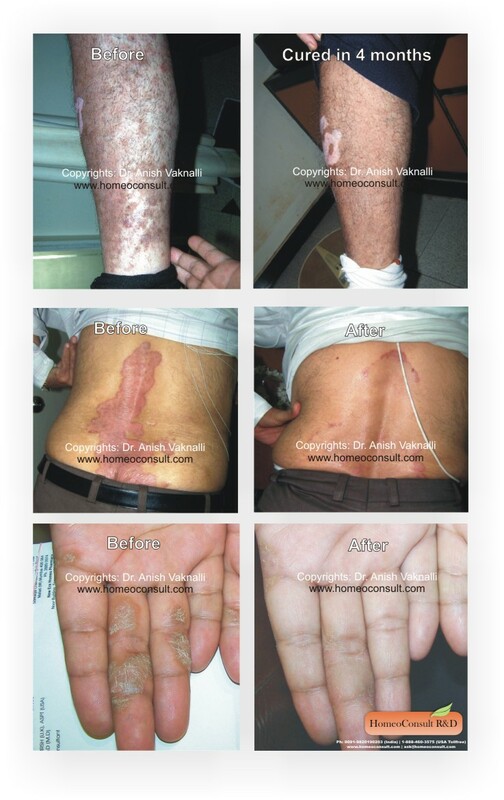 In psoriasis the affected lesions shed ever 3-4 days resulting in a buildup of silvery scales. The dry scales penetrate your superficial skin layer resulting in itching. 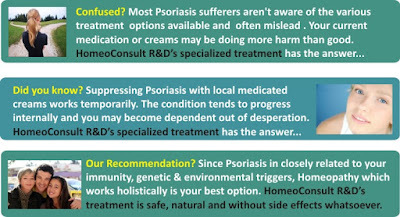 There is no definite cause of psoriasis. However, there is evidence of an autoimmune response in which the body's immune system mistakenly targets its own healthy cells. Environmental factors - Skin irritants, local trauma, infections, alcohol, steroid withdrawal etc. Physicians or Dermatologists usually prescribe local steroids or systemic drugs capable of directly minimizing skin-cell reproduction and controlling plaque formation. They do not help in correcting the mechanism responsible for the excessive shedding (plaque formation) and therefore requires to be taken for a life time. Excessive dependency may result in poor tolerance and the dosage of these drugs is often increased over time. Numerous side effects like liver damage and photo sensitivity are associated with these drugs. Our body constantly strives at bringing about normalcy by responding to changes it perceives reversible. In psoriasis and in most chronic ailments our body fails to respond appropriately due to a weakened state. Homeopathic medicines help by improving our body’s (immune) innate response and guide the body back to a healthy state, naturally.